During the years of collecting, Beatles Cover Versions have become a more and more important part of my Beatles mania. 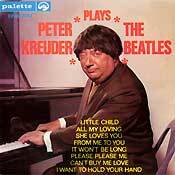 Collecting Beatles cover versions poses a slight problem. The amount of cover versions seems to be endless. Of "Yesterday" alone surely more than a 1000 versions are to be found. With these great amounts the cover area is difficult to oversee. Furthermore many of the cover versions are only to be found on regular artists' albums, which contain only one or two cover versions. Selecting is absolutely necessary. Therefore I try to restrain myself to collecting singles and / or albums with only Beatles' cover tracks with a special preference for the 60s and 70s. Just as with the related tribute versions, especially in the early years of the Beatles there were many artists who tried to get their share out of the success of the Beatles. 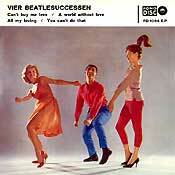 The release of Beatles tributes or cover versions is a way of making use of the success of the Beatles. Making a parody or a combination of all these varieties can also be seen as such. A frequent theme for parody is the use of the Mop Top Beatles' hairstyle. 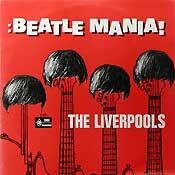 A very well-known variety on the mop top hairstyle and mop top wig theme is the "Beatlemania" LP by the Liverpools. 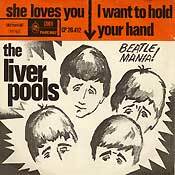 The LP shows the clever use of 4 drawn heads with pony hairstyle, (only) 4 Beatles cover-tracks and the name "Beatlemania". All this was enough to promote and sell the LP. Another special kind of cover version is the cover version is that sung by the artist in his or her own language (not English). Also Holland has its own translated cover versions. 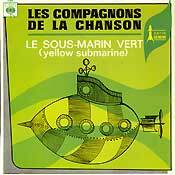 A much translated song is "Yellow Submarine". 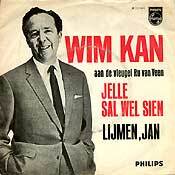 Translated as "Jelle zal wel zien" and performed by Dutch entertainer Wim Kan, it became rather famous. The Dutch singer Karin Kent made her own version of the same translation. The Wim Kan cover version became well known but most of the translated cover versions were made in very small quantities and remained unknown. Therefore it's quite difficult to find these cover versions and to get some idea of what has been released.